Kevin Jeffress, who is taking part in the Torremolinos half marathon. 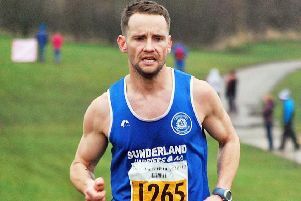 Sunderland Harrier Kevin Jeffress will miss out on the defence of his North East Masters’ Cross Country title at Wallsend on Saturday, February 2. The Seaham athlete will be in Torremolinos for the Half Marathon on the following day. “I’m a bit gutted that I will miss the Vets championships,” said Jeffress, who would have been bidding for his fifth title in a row in the Over-35 category. Jeffress, a seasoned Masters’ Cross Country international, who was a member of Sunderland Harriers winning team in the Birtley Cathedral Masters Cross Country Relays on Sunday, is looking for a fast time in Torremolinos. His best stands at 71.48 from his winning run from last year’s Vale of York Half Marathon. He has also another event in his diary, the Port of Blyth 10km which incorporates the British Masters 10km Road Championships on Sunday, April 7. Jeffress now equals Brian Rushworth’s club record of four North East Masters’ titles which he won as a Over-45 between 2008 and 2012. But Rushworth’s most significant record is his feat of winning 10 North East Senior Men’s titles. He ran his last race in 2014 before injury forced his retirement. Birtley AC took the limelight at the weekend with their excellent organisation of their Cross Country Relays at Lord Lawson School and their top runner Adrian Bailes, better known as a middle distance runner, winning the popular Brass Monkey Half Marathon at York (69.42). He hammered his previous fastest time set in last year’s Great North Run (78.33). Sunderland Strollers were out in force at York, with Andrew Forbes leading them home with his time of (1.20.48), Jamie Collin followed (1.21.08), then came John Cook (1.22.42), Christopher Dwyer (1.23.10), Andrew Duke M45 (1.25.23), Wendy Chapman W45 (1.27.19) Gary Dunmore M50 (1.32.30), Andrew Dobinson M50 (1.34.56) and Hasina Khanom W35 (1.41.07). Sunderland Harriers had Martin Blenkinsopp M45 with (1.22.47), David Wilkinson (1.24.25) and Judith Thirlwell W45 (1.38.17). Houghton Harriers saw Matty Tomlinson M45 clock (1.28.42), Gillian Tomlinson W50 (1.40.41) and Marguerite Harvey W40 (1.43.26). Sam Thurlbeck, an Over-35 and a recent recruit to Sunderland Harriers, got his athletics career off to a good start by winning the Sunderland parkrun at Silksworth. He clocked a PB of 18.36 improving from 18.53. Houghton Harrier Henry Johnson claimed the Under-17 1,500m silver medal in the Northern Athletics Indoor Championships at Sheffield. He clocked 4.08.32 behind the winner, Daniel Payne (4.02.94) of Middlesbrough Mandale. The previous week, Johnson had claimed second place in the BMC indoor 1,500m (3.57.91) at Sheffield to head the UK Under-17 rankings. At the Northern Indoor Championships, Sunderland Harrier Declan Murray finished third in the Under-20 pole vault with a height of 3.80m. The Durham County Schools’ Cross-Country Championships takes place on Saturday at Barnard Castle School, DL12 8UN. 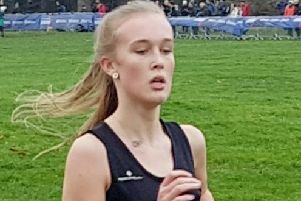 Athletes will then be selected for the Inter County Championships at Temple Park on February 2, before final selection is made for the county team for the English Schools Championships at Chelmsford on Saturday, March 16. Time table: Course open and registration 12.30pm-1.30pm. Minor Boys: 1.30pm, Minor Girls: 1.40pm, Senior Boys: 1.50pm, Senior Girls: 1.50pm, Junior Girls: 2.15pm, Junior Boys: 2.30pm, Intermediate Boys: 2.45pm, Intermediate Girls: 3pm, Finish 3.30pm.